The last week of March was spent tying up loose ends and balancing work, family, and social commitments. 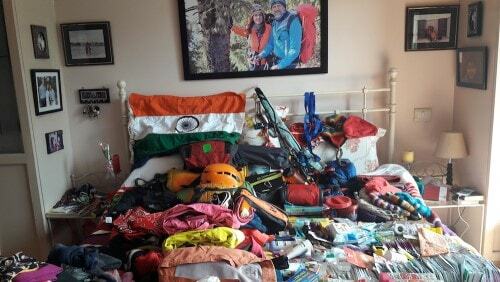 Packing for this expedition has taken months of preparation, and all little things had to be put in place ranging from ordering Everest gear and leaving nothing to chance. Family is my biggest strength and I have had enormous unimaginable support from my Everester husband Ankur Bahl who has guided me so well and whom I love so much, and my loving adorable son Aarnav who might not express in words but replaces it with warm hugs and small notes left for me here and there, my parents who have been there always, my inlaws who have supported climbing and looked after Aarnav when I first started. Wishes galore have come in from all quarters right from my school buddies, college alumni and universities to professional companies, image consultants fraternities, toastmasters, close friends who have thought of me in ways I never imagined. I have been sent flowers, given personalised gifts, have had standing ovations during my talks. I have been sent hand and foot creams, anti-frost lotions from Siachen base from a veteran paratrooper. I couldn’t ask for more as I am blessed beyond measure. My heart is tender and overflowing with love for the support, but my mind is strong to handle whatever challenge comes my way. Mount Everest, here I come!.. slowly treading up with my head bowed down in gratitude. I am here to conquer myself with the biggest challenge of my life!